A 1960s style panoramic lineup. 47739 was new as D1615 from BR Crewe on 29th August 1964. Renumbered 47035 in February 1974, 47594 in September 1983, after fitting of ETH, then 47739 in August 1994. In July 2007 this was sent to the EMR scrapyard at Kingsbury, but was removed that October, firstly to Marchwood, and then to Eastleigh. After overhaul it worked for Colas, and was named Robin of Templecombe 1938-2013, the latter dates added posthumously. The loco has now been sold to GBRf, and is at Eastleigh for repainting into GBRf colours. 47848 was new as D1652 from BR Crewe on 16th January 1965. Renumbered 47068 in March 1974, 47632 in December 1985 after ETH conversion, then 47848 in December 1989. 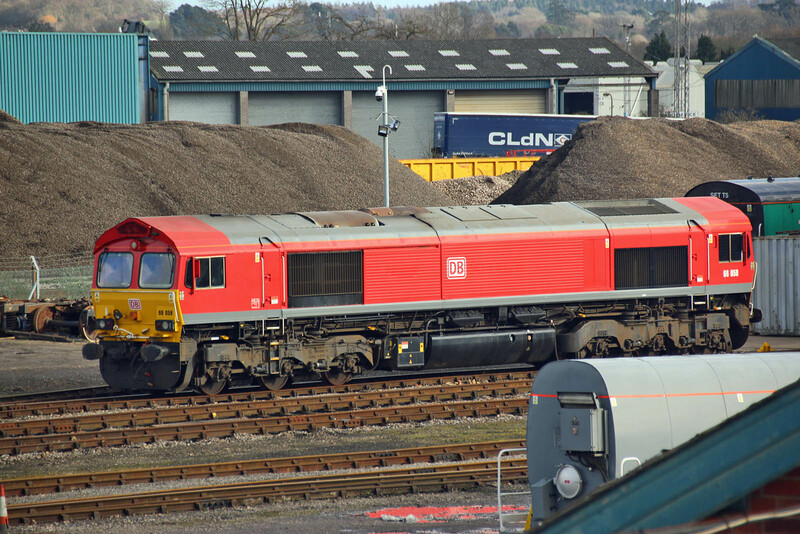 This locomotive saw usage with Virgin until 2002, then with Freightliner, Riviera and now Rail Operations Group. 73133 was new as E6040 from English Electric Vulcan Foundry on 7th August 1966. In recent years it has seen shunt duties at Taunton, Bournemouth and now Eastleigh, in the ownership of Transmart Trains. 57003 was new as D1798 from Brush, Loughborough on 29th January 1965, later renumbered 47317 in March 1974. Converted to Class 57 for Freightliner in October 1998, and later moved to DRS. Now stored at Eastleigh. 37884 appears to have been taken indoors for attention to commence. 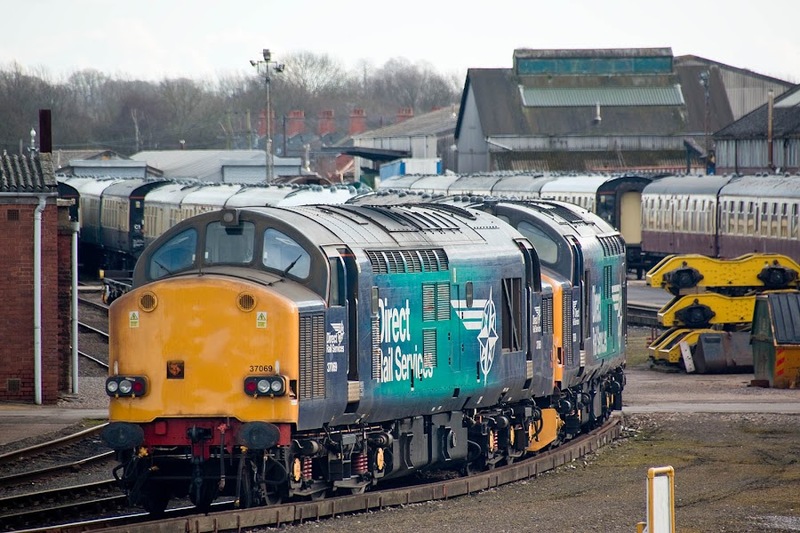 The purpose of the visit was the anticipated return to Crewe of this pair, but they now seem to be staying at Eastleigh for a week, and then will work a further tour on Saturday 17th. 37069 was new as D6769 on 17th July 1962 from English Electric Robert Stephenson & Hawthorns at Darlington. Renumbered to 37069 in February 1974. Spent time in France in 1999 - 2000, but then to DRS in 2002, although stored between May 2012 and October 2015. 37609 was new from English Electric Vulcan Foundry on 22nd February 1963 as D6815 allocated to Sheffield Darnall. Renumbered 37115 in May 1974, when allocated to Tinsley. Refurbished to 37514 in March 1987. Renumbered 37609 in April 1995 and transferred to European Passenger Services, then transferred to DRS in July 1997. Class 47 front ends - 47739 and 47848. 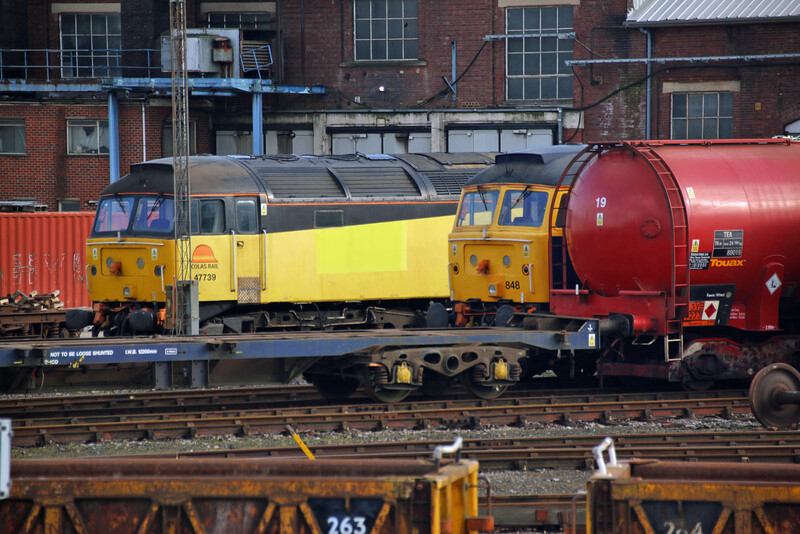 66058 waits in the queue for a transformation into GBRf colours.